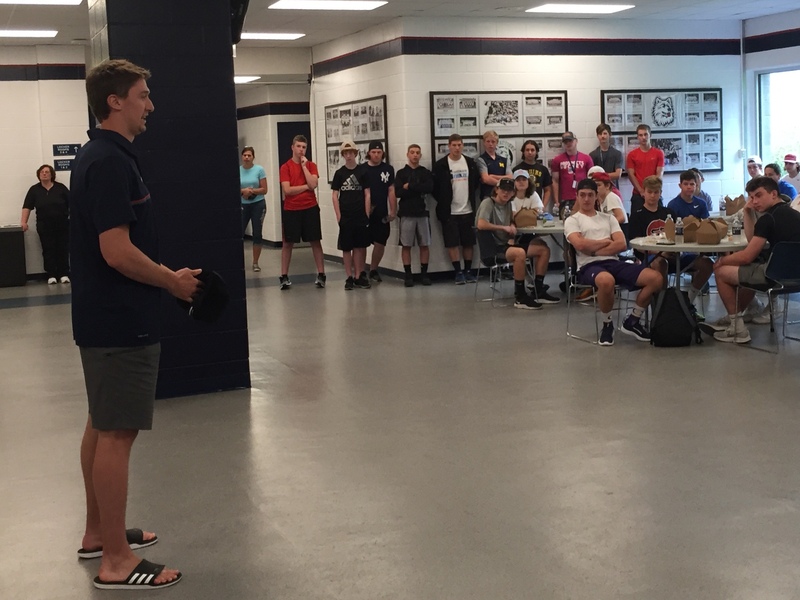 Why attend the CT Elite Hockey College ID Showcase at UConn? This is a showcase where players will enjoy a collegiate hockey experience while getting to know coaches from top DI to DIII programs in the Northeast. 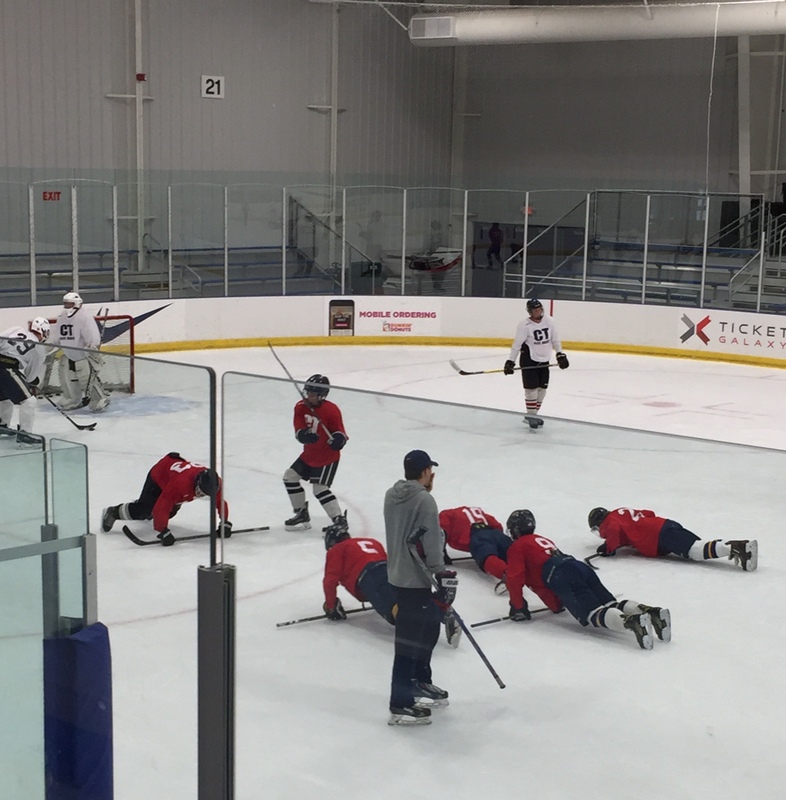 The players will be immersed in a 3-day schedule that will feature high energy practices with skills drills and games, and spirited contests between the four teams assembled for the camp. Players will also participate in game video sessions, strength sessions and in-classroom seminars, live in the college dorms, eat at the college cafeteria and overall get a taste of how the college student athlete lives. The players will be surrounded by college hockey players throughout the experience, on and off the ice, who will be accessible to discuss anything and everything related to hockey. Each team assembled in the College ID Showcase will have three practices. Practices will also involve scrimmages. A goalie coach will be on hand for practices for goalie-specific instruction. Film will also be reviewed by the goalie coach and goalies will be given pointers. Campers will participate in three games also coached by DI, DII and DIII coaches as well as collegiate hockey players. The games will be filmed and tape will be reviewed with the teams. Players will get specific feedback about their play, as well as the team as a whole. 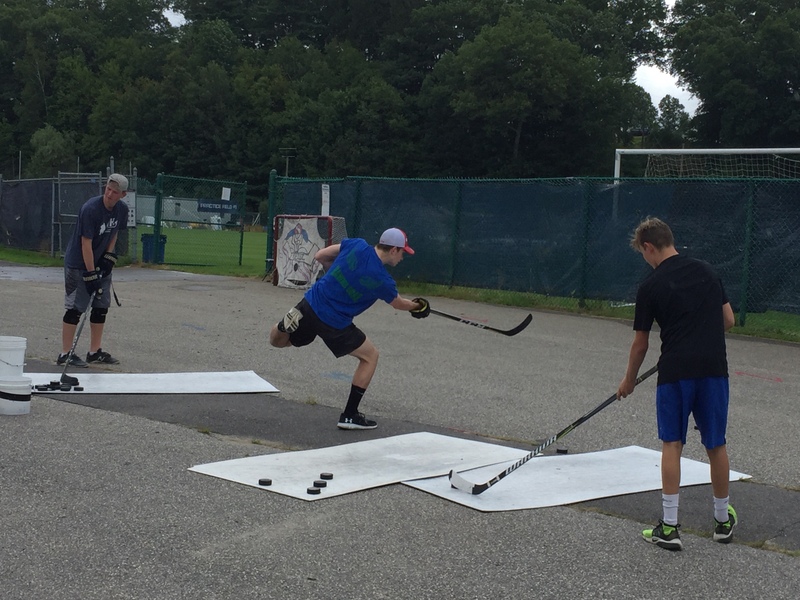 Opportunities after High School Hockey: Campers will engage with coaches and players on what's out there once after high school: Where exactly can a high school player go after their high school career is over? What puts players in the best position to play juniors or college hockey? How much do grades and test scores affect your options? How can you prepare now to continue their playing career? How do you get a program's attention? Current college players will discuss their road to college hockey - what personal sacrifices they made to get there, what their hockey decisions were through the years that helped them develop and grow - did they participate in juniors? Did they attend camps and tournaments? What was successful to their development? Beyond Talent: How you can stand out off the score sheet: As you develop your role on your high school or junior team, there are off-ice skills you can develop that sometimes far outweigh what you could ever post to a score sheet. If you can stand out for your work ethic, character or leadship abilities that may your edge that others don't have. Knowing your role, playing unselfishly, supporting your teammates and being a leader in the locker room are all critical skills. In this seminar, current college captains will discuss what it means to be a team player and what qualities and traits make the best teammates. They will discuss how to be coachable, how to give and take feedback, how to handle conflict within a team, and how to become a leader. Using their personal experiences from youth hockey to college hockey, they will review situations that often arise on any team and interact with campers on solutions. Campers will leave knowing the top traits to become a better teammate and leader, and what coaches mean by work ethic and character. Collegiate strength coaches will lead the campers in typical collegiate strength sessions specifically geared for hockey players. The strength coach will review the exercises and how they help the hockey player. OVERNIGHT CAMPERS: Check-in will be in the mid-morning at the South Dorm Complex. We will post more information as it gets closer. The campers will be organized into four teams. Campers will find out which team they are on at check-in. We always have last minute adjustments to team assignments so it is difficult to finalize earlier. We will not have the schedule posted until the showcase dates are closer. But you can look at last year's camp schedule to get an idea of how each day looks. For the College ID Showcase, participants will be housed in the South Dining complex. The air-conditioned dorm rooms are suites - with two bedrooms that sleep two campers each, a living space and a bathroom. Specific requests to board with a teammate can be made on the registration form. There will be adequate supervision in the dormitories. Additionally, the University of Connecticut will position an employee at the dorm. Each camp participant is required to sign a code of conduct of expected behavior at the camp, while participating in all aspects of the camp. Camp counselors will be with participants every step of the way to enforce the code of conduct. Upon check-in, each camp participant will receive an ID/security card that will allow him to access dorms, dorm room, and will also serve as a meal card. Dorms will not be able to be accessed after 11 p.m. each evening and camp counselors will conduct a bed check upon curfew that is set. Meals will be served at a dining hall to be confirmed by University. We will provide a CT Elite Hockey showcase jersey for the team assigned; you will need to bring your own hockey gear including sticks and tape. Helmets must have a full face shield. Skate sharpening will be available for $5. Linens are provided, including sheets, a blanket, a bath towel and hand towel and pillow/pillowcase. You will need to bring toiletries. No shower caddy or shoes needed. The bathroom is located in the 2-bedroom dorm suite so you can leave shampoo and soap in the bathroom. Water and snacks for dorm room if desired. Dorm rooms have free WiFi and Ethernet wall connections for the boarders use. There is a food court on campus in the student union, as well a a student book store for essentials/snacks. There is also a game room in the student union. Participants must inform CT Elite Hockey of current allergies and/or medication on the registration form. The camper will be responsible for administering any medications throughout the camp. If bringing medicince to the camp, you will need to complete this form and have a physician sign it. As necessary, camp counselors will be informed of allergies and medications to be alert to any issues. Dismissal will vary each day depending on which team your camper is on and will occur at the rink or at the cafeteria depending on camper's schedule. Day 1 - Wednesday, July 31: 7:15 p.m. and 7:45 p.m.
Day 2 - Thursday, August 1: 6:00 p.m. and 6:45 p.m.
Day 3 - Friday, August 2: 10:45 a.m. and 12:00 p.m. Meals will be served at a dining hall to be determined. The day camper will receive an ID/security card that will allow him to receive meals. CT Elite Hockey will provide you with a jersey; you will need to bring your own hockey gear including sticks and tape. Helmets must have a full face shield. Skate sharpening will be available for $5. Towel for in your hockey bag that will be hung in the locker room for showers in the locker room. The campus has free WiFi available in public places. Participants must inform the CT Elite Hockey of current allergies and/or medication on the registration form. The camper will be responsible for administering any medications throughout the camp. As necessary, camp counselors will be informed of allergies and medications to be alert to any issues. Click here to obtain a medicine authorization form. If your child will be taking any medication at the camp, this form will need to be completed by parents and your child's physician. Click here for more information about options for your child with allergies.